"Most people think dark circles are something you deserve – due to a sleepless night, excessive stress, or even strained eyes. In reality, dark circles aren’t your fault. These bothersome blemishes are caused by oxidized hemoglobin in the fragile skin beneath the eyes. Extreme cases of dark circles can make you appear sick, tired, much older than you really are! This decline in your natural beauty not only affects your self-esteem, but it can influence the way others act toward you. 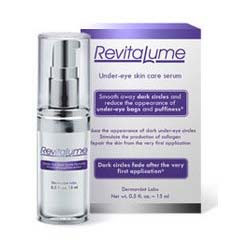 Fortunately, there’s a solution that works right away: RevitaLume"
I know not only me, but many of my readers suffer from dark under eye circles. I'm constantly being asked what the best eye creams are. Revitalume is a fast acting formula that lightens and brightens your appearance in minutes! Not many skin care products offer instant results and actually deliver. So me and my boyfriend received the Revitalume, and we tried it right away. Within 15 minutes, my tired eyes were gone. Now don't be fooled this isn't a magic cream. With the first use it will not completely fade away your dark circles, but you will notice a significant difference. With continued use however, dark circles will go away. It's been a little over a week now, and I've noticed a huge change in my under eye area. I notice most when I put on my makeup and I'm not using as much concealer as before. Woo hoo! You can try Revitalume for FREE, yes I said it, get a free trial here. You only pay $4.95 for shipping and handling, but you'll be able to see the results first hand.